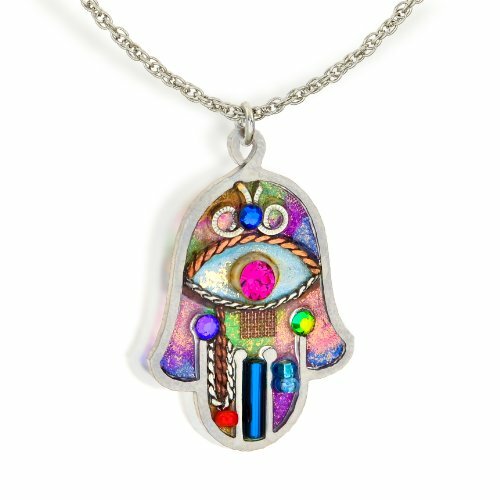 The Hand of Fatima symbol, also known as the Khamsa or Hamsa hand and the Hand of Miriam is an ancient symbol of protection that has been used for thousands of years.Â If you're interested in the meaning of the Hand of Fatima or Hand of Fatima tattoos, necklaces or other jewelry, check out Evil Eye Jewelry at Hand of Fatima. Â Interested in healthy food option?Â Consider trying black rice, also known as forbidden rice.Â This forbidden black rice has much higher levels of nutrients than does regular rice. The Hand of Fatima, also known as Khamsa or Hamsa and Hand of Miriam is represented as an open right hand with an eye in the center. It is popular as an amulet, in other jewelry, as wall hangings and other artwork in the Middle East and North Africa. This iconic symbol has been recognized and used as a symbol of protection for thousands of years. The hand of Fatima or hamsa is believed by some to be a defense against the evil eye - a malevolent stare given by individuals believed to be able to cause sickness, death, or simply bad luck. The Fatima symbol existed long before the rise of Islam but it is the Islamic religion and Arabic culture which continues to make most use of this symbol today. In Arabic culture it is called the hand of Fatima, to commemorate the daughter of the prophet Muhammad, Fatima Zahra. It became known to Europeans as the hand of Fatima as well through trade and conflicts with Arabic culture, particularly in Spain during the period of Islamic rule. Well after the Islamic rule ended in Spain the use of the symbol of the Fatima icon was still so widespread that it caused Emperor Charles V to ban the use of all symbols representing the Hand of Fatima. When its use spread into Jewish culture it became known among the Jews as the Hand of Miriam, referring to the sister of Moses. Later, the use of this symbol spread to Levantine Christians who again renamed it, this time in commemoration of the Virgin Mary, calling it the Hand of Mary symbol, after the mother of Jesus. It is also referred to as Hamsa, also romanized khamsa, in Arabic culture. Hamsa is Arabic for "five", but may also mean "the five fingers of the hand." The origins of the Fatima talisman are unknown. A universally recognized sign of protection, this image of an open right hand can be found in ancient Mesopotamian artifacts as well as in the Buddha's open handed gesture of protection. Other cultures have also used open handed symbols of divine or supernatural protection including the Hand of Aphrodite or Venus as well as the Hand of Mary which was used to offer protection to women from the evil eye, could supposedly increase fertility and lactation, promote healthy pregnancy and could strengthen the weak. Some scholars believe that a connection exists between the Hand of Fatima and the ancient Egyptian symbol of the Mano Pantea or the Two Fingers. The Mano Pantea represents the Egyptian goddess and god Isis and Osiris and the thumb represents the child of their union, Horus. The Two Fingers symbol was used to invoke the protection of Isis and Osiris over children by their parents. The Hand of Fatima icon, Khamsa or Hand of Mary is often seen in gold and silver jewelry. It is also painted in red on the walls of houses or on tapestries hung in entrances of homes in the Middle East and North Africa to offer protection to the occupants. 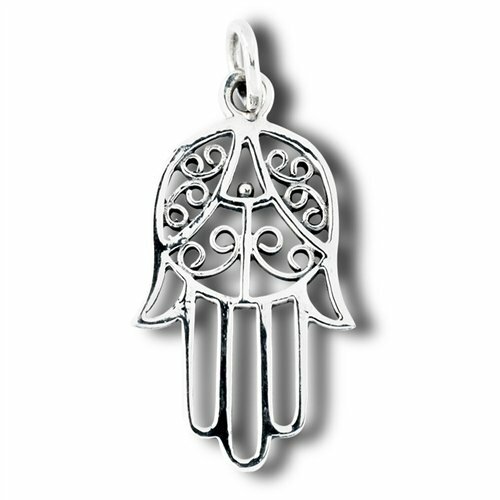 When the Hamsa is represented with the fingers spread, it is designed to ward off evil, when the fingers are closed it is meant to bring good luck. Often the Hand of Fatima is shown with a symbol of an eye in the center to ward off the evil eye. Aside from wearing this ancient iconic symbol as jewelry and displaying inside the home many people go to the extreme of getting Fatima tattoos. Hand of Fatima jewelry remains so popular that it can often be found in jewelry stores throughout the world. You can even buy Hand of Fatima necklaces online at Amazon. Several of these are pictured here on the page. The Hamsa, or hand of Fatima is so intertwined with Arabic culture that even today the hamsa symbol is used in the national emblem of Algeria. In Egypt it is the most popular amulet used to protect against the evil eye in Egypt.